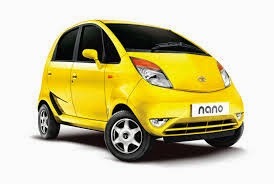 My Heart Whispers to Me..........: TATA Nano: Has the dream gone wrong? TATA Nano: Has the dream gone wrong? 2-wheelers are preferred over 4-wheelers to avoid traffic snarls in congested cities which TATA Nano failed to provide to its users and ultimately failed to be an option for 2-wheelers. Initial technology hick-ups and long waited delivery periods took the shine away from the product. TATA Nano due to its smaller design and appearance failed to create ownership charm for its users to some extent. Positioning it as a cheap car is the biggest mistake as it will take away pride of ownership and most of the customers will not like it for sure. Lesser boot space also hinders prospect of long drives at regular intervals. Today customers are moving towards better looking vehicles which can provide more comfort, safety, performance and status quo. This is the reason that hatchback and sedans' market is continuously growing in India whereas in recent times smaller cars has seen decline in sales.